Horrible, breaking news: Congresswoman Gabrielle Giffords (D-AZ) was shot at close range outside a Safeway grocery store in Tucson while hosting a public event. Update: She's in "very critical" condition. The story's still developing, but CNN reports that at least 12 people were shot during the incident. The gunman's been apprehended. 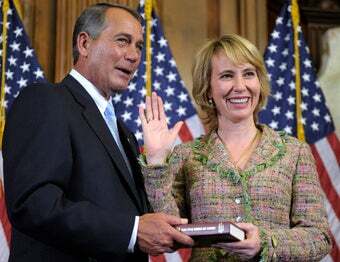 Elected in 2006, Giffords was just sworn in this week to begin her third term. She also appeared on Sarah Palin's Take Back the 20 list of House Democrats who voted for President Obama's health care law. Palin's website includes a map with bulls-eyes, along with the text, "We've diagnosed the problem ... help us prescribe the solution." We're not pinning the blame for this horrific tragedy on Palin, but the ex-governor of Alaska does know that her followers are not above advocating violence. Surely we'll find out soon if there's any connection. Update: Giffords is not dead, contrary to numerous news reports. She is in surgery. Also, we just tried to visit Sarah Palin's website at 4:43 EST and received the "problem loading page" message. Update: The President has issued a statement in which he says some victims have died. Update: Giffords was shot once in the head; the bullet penetrated her brain. Yet doctors are optimistic about a recovery. Update: Here's the YouTube channel of the alleged gunman, Jared Lee Loughner.